TC automatic rotating / rotary tensioners make it possible to maintain the correct tension of the transmission chain or belt, thereby increasing its durability. 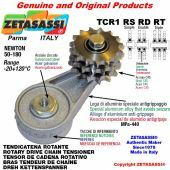 They automatically recover any slack in the chain or belt that may develop with use, preventing the appearance of vibrations, noise and breakage due to slack. 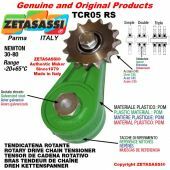 These automatic rotary tensioners do not require any kind of upkeep and make it possible to save time on maintenance and management of the machinery on which they are installed. 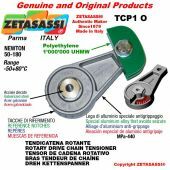 The rotary tensioners TC1 and TC2 models consist of a base and lever in special, very sturdy, antiseize aluminum with tensile strength of 440MPa, which ensures perfect glide of the lever and central fastening rod in high tensile strength galvanized steel.Elastic elements in steel with a very high yield point and initial preload are inserted in the tensioners, ensuring the most constant pressure range possible.. In addition, the specific mechanical properties of the material prevent wear on the elastic internal elements due to movement, so we are able to supply a product of absolute excellence in this field. 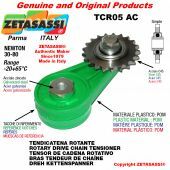 The rotary tensioners TC05 models are the version in sturdy POM plastic material. 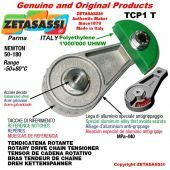 The rotary tensioners TC08 models are the version completely food- approved, in plastic material colored with food-grade dyes and mechanical parts in AISI 316 stainless steel, with internal elastic elements in AISI 302. 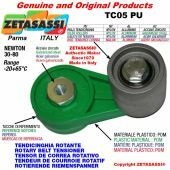 All rotating TC tensioners are characterized, in particular, by the tensioning angle of over 45° in both directions of rotation. 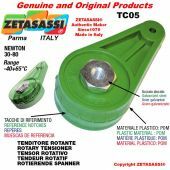 They are easy to install, because they can be fastened to the machine either with screws from the inside or from the outside, with rear stop slots to block rotation on imperfect or irregular surfaces and reference notches for adjustment of the preload. 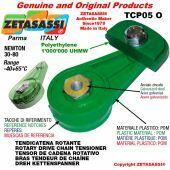 They can be supplied with chain tensioning shoes in polyethylene 1,000,000 UHMW with dynamic dry steel friction coefficient 0,06, chain tensioning pinions, belt tensioning rollers and idle pulleys. A version can be produced for all models with central rod in AISI 316 stainless steel and internal elastic elements in AISI 302.